The West Hollywood Planning Commission’s design review subcommittee gave a largely positive assessment Thursday of plans for a six-story residential and retail building to be built on the site of the Faith Plating plant on Santa Monica Boulevard at North Formosa Avenue. 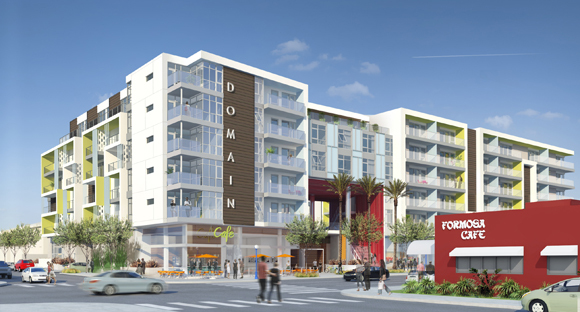 The project, which will go by the name “Domain,” includes 166 residential units (including 33 affordable housing) and 9,300 square feet of retail space at street level. It will be built by the San Juan Capistrano-based Walbern Developments. The building will be six stories high (72 feet) on the Santa Monica Boulevard side, but only three stories (36 feet) at the back of the lot, where the area is residential. Architect Alan Pullman of the Long Beach-based Studio One Eleven firm said the centerpiece of the project will be a three-story portal allowing views of the Hollywood sign in the background. That portal will have a bright red metal covering designed to tie into the red-painted Formosa Cafe, the Chinese restaurant directly across the street famous as a former hangout of Hollywood stars. The portal will also feature a staircase leading to a public seating area on the second level of the building. Behind a gate there will be a courtyard with a swimming pool for residents. Altschul questioned the size of the project. But, noting the two six-story Monarch Group retail/apartment projects going up nearby, the first at the old Carl’s Jr. restaurant site on the northwest corner of Santa Monica Boulevard and La Brea Avenue, and the second at the old Jon’s Market site (a longtime favorite of the Russian community living on the Eastside that closed its doors in May 2011 on the southeast corner of La Brea and Fountain Avenue), and a proposed seven-story Movietown Plaza project (on Santa Monica Boulevard at Poinsettia Place), he said it would likely fit in. Walbern Developments will be required to remove toxic waste from the so-called brownfield site, whose soil is contaminated by the heavy metals used by the 95-year-old Faith Plating Co., which is the world’s largest replater of chrome automobile bumpers. In 2005, the Hanover Company planned to develop the site, but the economic downturn forced it to abandon the project. Architect Pullman said his company took those original designs and improved upon them. Levin said he is relieved that the site will now be cleaned up. He said he fears every day the potential health risks to residents living near the contaminated lot. Walbern officials said the designs will likely be tweaked based on the feedback they received. The project is expected to go before the Planning Commission later this spring. 5 giant projects within a quarter mile of each other. traffic is already heavy on la brea and the nearby cross streets. this area will be in gridlock. who wants to live surrounded by exhaust fumes? Sorry if removing the source of cancer causing causing toxins causes you a few extra moments in traffic. I would argue that the design of this is far superior then many of the mixed-use buildings recently built or under construction. However what’s most important is that this company is willing to undertake the massive job of cleaning up a property that may very well be poisoning the neighborhood. I only hope that the city allows for the clean-up to begin prior to building permits being issues. Even if this ends up being a parking lot, it’s better than what exists today. lynn russell, i agree with your thoughts on this. very well said. i find all this ‘nicely-fitting-in’ harmlessly modern conformity a bit bland but so be it. they get points for mixed use. as usual the elephant in the room is the absence of a comprehensive traffic plan. to me the most important issue relating to this project is the quality of the clean-up of the toxic site. we better get this one right or we’ll all breathing chromium dust and drinking carcinogen water. “Magnificent and gorgeous” and “will sit nicely on the site” are two curious comments. This project will admittedly fit in nicely with the area that “is getting big”. Fitting in nicely is not necessarily a compliment. Viewing the portfolio of work at Studio One Eleven and Newman Garrison of the Monarch Project there appears a harmony with each other and countless other recent projects in Hollywood and Weho. But where is the inspiration that sets them apart from countless other projects large and small. Where is the dialogue with the location whether it be specific, regional or climatic? Where is the relationship with the past or the environment? Although growth is necessary and housing important does this have to be at the expense of inspiration and context which contributes to a sense of belonging to rather than landing on a plot of ground? If one looks closely to the similarity of the last raft of housing built some years ago that now looks tired and colorless, and in need of a lift, one wonders how these structure of limited shelf life keep propagating as if by the Rubik’s Cube School of Architecture. An illustration of magnificent and gorgeous would be the recent work of John McAslan and his King’s Cross Station in London, which created a dialogue between Lewis Cubitt’s 1852 Victorian train station and 21st century architecture. It is a magnificent example of re-use, restoration and new build. This type of dynamic and be accomplished in any size.